The Commercial Space Shuttle Freighters will be designed to: support near earth space transportation requirements, provide the capability for deep space exploration, support mankind’s need to obtain deep space resources, provide rapid response to deep space threats, and establish populated safe havens in deep space. Affordable and sustainable space transportation for the 21st century must be based on commercially operated reusable launchers and space based vehicles. This requires a space transportation system that has the capability to return commercial quantities of near-earth and deep space resources to the Earth’s surface…a commercial space shuttle (CSS) freighter. The CSS freighter using the decommissioned Space Shuttle’s configuration and reduces the NASA concept mission cost to $205 million; however there are many existing technologies that will reduce the freighter’s operational cost to a profitable level for commercial enterprises. The launch cost will be significantly lower than those of an expendable launch vehicle, primarily because of increased reliability and lower insurance costs for the CSS freighter. The CSS freighter uses the orbiter airframe profile and will be autonomously operated. Passengers will be flown only on missions requiring their presence. For these missions, they will be provided escape pods which provides protection for launch, on-orbit, and entry anomalies. Launch pad assembly of the freighter will reduce operations cost and turnaround time. Rapid turn-around is a unique CSS freighter feature which reduces operation’s cost, provides the capability for timely intercepts of threating asteroids/comets, and supports USAF rapid deploy missions. No NASA support will be required for the operations of the CSS freighter or space based vehicles. NASA’s role in space transportation will be to develop advanced concepts for the space freighters and space based vehicles needed for near earth and deep space operations. NASA, however will/or can be in charge of research space probes delivered by the CSS freighter transportation system. The payload delivery capability, landing weight limits, and launch cost of the CSS freighter will establish the design boundaries of the future space based vehicles. Therefore the CSS freighter’s operational capability will be the cornerstone for planning and development of the 21st century’s space transportation system. · Deliver and return 20 metric tons to and from a circular orbit of 240 nm at an inclination of 28.5 degrees. · All mission phases conducted by autonomous operation with ground control backup flight guidance. · Provide escape pods for up to 4 passengers. Passengers will have no flight control authority. · Provide 4 days nominal on-orbit operation plus 8 days in power down mode for contingency passenger retrieval. Dormant (no passengers) on-orbit systems will be designed for 60 days in gravity gradient attitude for repair or retrieval of disabled freighter. · Orbiter return to launch status will not exceed five days. The business model considered by Lockheed Martin for the VentureStar commercial launch vehicle fleet may still be the best option. Lockheed Martin proposed to build a minimal commercial fleet of vehicles. One cost estimate for the fleet was $8 billion in 2014 dollars. NASA and other U.S. government customers were expected to make a certain guarantee for a specific number of payloads (launches). Unfortunately the VentureStar had unsolvable development problems. In reality this is the same business model that the USAF has with United Launch Alliance and unfortunately the extreme operating cost of their expendable launch vehicles has made this an untenable business contract. Since the flight systems for the CSS freighter are still being evaluated development cost cannot be made at this time. However, by selecting existing subsystems with little or no development requirements, it is believed that the launcher can be finance with funding from the private sector. The following chart shows the launch cost breakdown of the decommissioned NASA space shuttle and the expected cost of a CSS without NASA civil service personnel and government purchasing cost. Also discussed are existing technology achievements that have applications which can be expected to reduce the CSS freighter launch cost of $205 million to less than the current cost of existing heavy lift expendable launch vehicles. · Orbiter Configuration: The airframe exterior will not be significantly altered. However, since no crew windows will be required a ballistic nose cone similar to that of the X-37B will be investigated. Composite material will be used to reduce weight as was accomplished for the Boeing 787. Composite material can reduce the orbiters weight by 20 percent (approx. 15,000 lbs.). Initially this weight saving should be used to reduce landing loads and the size of the external tank. Composite materials are expected to reduce the maintenance costs. · Integrated Vehicle Health Management System (IVHM): A major contributor to the high costs of current space vehicle systems is the operations, maintenance, and infrastructure portion of the program’s total life-cycle costs. Incorporation of IVHM with distributed remote health nodes, fiber optic distributed strain sensor, and fiber distributed data interface communications components will result in significant program life cycle savings by improving reliability and lowering operational costs. Computer technology has advanced to the state that an onboard IVHM computer system can verify the status and control all vehicle systems. It has been proved to be extremely effective on modern aircraft and spacecraft. The ground and flight software developed for the Lockheed Martin VentureStar and X-37B could be a baseline design for reducing the cost and development time of the IVHM system. · Modular Flight Subsystems: Subsystems must be a modular concept, designed for unconstrained replacement. The spare parts operation must be based on modular replacement of the subsystem. Modular replacement is required to reduce the time for replacing flight failed subsystems from days to hours. Modular replacement designs must consider launch pad and on-orbit replacement of failed equipment. · Orbiter Propulsion: All Hydrazine is removed from the orbiter. The attitude control propellant is replaced with a “green” propellant such as AF-M315E. The orbital maneuvering system for major altitude changes is a hybrid engine with liquid oxidizers and a solid fuel such as hydroxyl-terminated polybutadiene (HPPB). These fuels decrease processing time and increase safety. The Dream Chaser hybrid rocket motor is being considered to replace the orbiter’s hydrazine OMS. · Thermal Protective System (TPS): The NASA Space Shuttle TPS is not acceptable. However, the TPS is not believed to be a development issue with the current available materials. Use of metallic tile, mechanical fasteners, carrier panels, carbon-carbon, rigid ceramic and other current technology will be considered. The TPS must be able to withstand impacts and/or be repairable on-orbit. The vehicle health monitoring system will monitor the TPS for any breach. On orbit repair of TPS will be developed. · Toughened unipiece fibrous re-enforced oxidation-resistant composite, (TUFROC), to cover the wings’ leading edges. · Toughened unipiece fibrous insulation,” (TUFI), to replace ceramic tiles and reduce weight. · Design a robotic flight vehicle system to repair on-orbit TPS failures. In-flight inspection using the integration of thousands of sensors into a pattern of fibers located in the TPS will provide real-time structural health of the freighter. Any breach in the TPS will be repaired by an on-board free fly spacecraft designed for multi-purposes repair. TPS repair kits fall into two basic categories, mechanical or chemical. Mechanical repairs systems rely on prefabricated materials and fasteners. Chemical repairs rely on materials that are applied in a raw form and develop into a chemical adhesive bond to the TPS. · Electrical Power System: Consist of solar arrays and ion batteries and/or an Electric Auxiliary Power Unit (APU) system designed to replace the Orbiter’s existing Hydrazine APU. The Electric APU consists of a battery, associated 270-volt power, distribution and control, electro-hydraulic drive unit, and cooling system. Electromechanical Actuators (landing gear, body flaps, elavons, gimbals) will be designed for those functions. The CSS will transport passengers to and from space in pods. Escape pod weigh is estimated at 700 pounds per pod. The pods provide protection for all phases of flight. At launch pad abort and lower altitudes escapes, a ballute deploys to slow the pod for parachute deploy. The pod’s life support system provides on-orbit safe haven in the event the cabin pressure is breached. Target lifetime for life support is 20 days to allow for on-orbit rescue. Pods are located behind the nose cone heat shield wake to reduce excessive thermal loads in the event of a Columbia type entry failure. The pod is also equipped with a heat shield system. The pod must be a “smart pod” ... it must have knowledge of the environment. · The CSS freighter will consolidate ground and flight operations at the launch site. The support launch team personnel will be responsible for both preflight and flight operations. · Pre-Mission Planning: Flight planning design computer programs have been developed that incorporate common databases, total vehicle environment modeling, and internal iteration processes. These flight design computer programs (incorporating sequential quadratic programming) have reduced the flight design from months to a few days and significantly reduced manpower requirements. · Launch Vehicle Assembly: Launch pad assembly of the CSS will reduce operations cost and turnaround time. The assembly complex will be on rails and be moved away from the launch platform prior to launch. The orbiter will be prepared for launch in a hangar facility and towed to the launch site for assembly. The freighter’s launch complex will be similar to the Vandenberg SLC-6 (Slick Six), however it will be designed for freighter launch operation. There has never been a shuttle launch complex specific designed for space shuttle operations. · Building will meet locality wind loads limitations. · Cooling tower water will be recycled. · External building dimensions will support one freighter. · Meet safety operation for current shuttle launch constraints (open building segment configuration). Payloads will be "encapsulated" cargo; that meets the power supply and berthing configuration requirements. The CSS will not serve as an on-orbit payload service platform. The CSS freighter is a "ship and shoot" and retrieval cargo operations. Nominal mission operation will not exceed 7 days. Payloads will have an allotted power usage limit. · No significant change is expected for the building’s external configuration or floor space. Internal layout is TBD by the selected orbiter systems. Note: It is not a frim requirement to use any exist NASA facilities for CSS freighter oerations. Past studies indicate that the thrust vectoring control system may not be required and that the SSME/RCS could provide all attitude control. Recovery of the SRM casing is not cost effective and will be discontinued. These two changes will significantly reduce the cost of the SRM. The four segments SRM will be sufficient for the initial CSS operations. Reusable fly back boosters will significantly reduce operations costs and increase reliability. However the initial cost to develop the booster may require that the space transportation market be established before development. SpaceX recent successful recovery of the Falcon first stage has proven that the booster recovery capability exists. NASA will not at any time be an operator of the CSS Freighter. It is expected that the composite cyro-tank will be available and reduce the manufacturing costs. 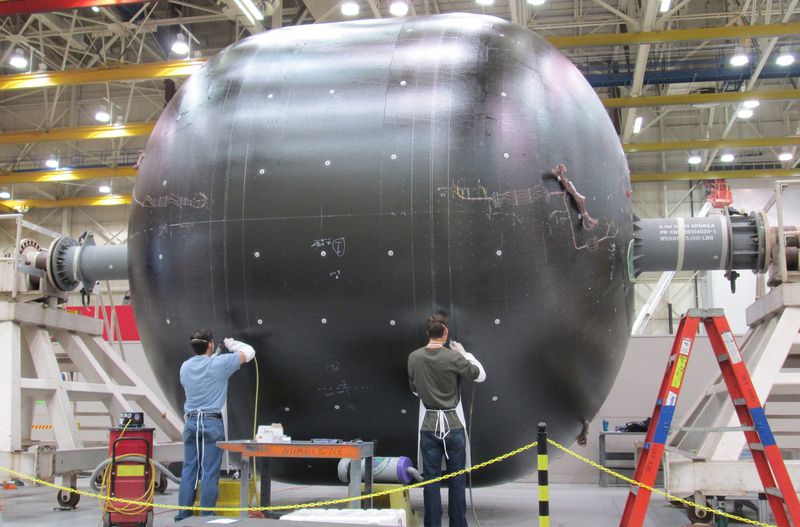 Manufacturing cost, not payload to orbit will be determining factor in the design of the CSS freighter external tank. The freighter thermal protective system must be impact resistant and on orbit repairable which permits the removal of the foam insulation from the ET. Reversing the hydrogen and oxygen tanks should be revisited. It is possible that the CSS freighter will demand higher flight rates, permitting more than one external tank manufacturing supplier. Tank manufacturing should be within trucking distance of the launch site. The external tank can also be a storage container for near earth and deep space requirements. The composite cyrotank is expected to reduce the tank weight by 30 percent and have a 25 percent cost saving over the external metal tank which results in a launch cost reduction of approximately $13 million. No GFE is required except that required for range safety. Logistics cost includes network, facilities overhead, and administration costs are averaged for 12 annual flights. This cost is significantly reduced as flight rate increases. The existing engine will be used for the initial CSS freighter. For future use the engine could adopt extensive use of integrated health monitoring and single cast construction of large components. High pressure pumps could be incorporated that can be flown 50 times before overhaul. Studies have projected that an advanced engine can be turned around in 58 hours as compared to the current time of 160 hours. Miscellaneous includes the cost of propellants and vendor supplies. This NASA chart shows that flight rate is key to lowering launch cost. It indicates that a launch rate of 12 flights per year reduces the decommissioned NASA shuttle mission’s cost to $400 million. Removing NASA from launch operations reduces the launch cost to $205 million and incorporating existing technology to the CSS freighter make the vehicle a competitive commercial launch vehicle. The predicted average commercial medium to heavy launches for the next 10 years is 11 per year. The CSS freighter has the potential to capture a majority of these launches by offering the unique capability of satellite on-orbit checkout before release and returning faulty satellites for repair. Once the space tug is operational, satellites can be serviced on-orbit or retrieved. The Freighter can offer tourist flights to reduce cost of cargo delivery. Ed Stein’s 2012 caricature captures the path of this nation’s manned space flight. The Space Based Transportation Plan can change that Path. The following chart outlines the development and operation of the CSS freighter that enables the construction of a space based fleet. The stair step approach provides a long range plan for needed technologies and space vehicle development. Each step is a building block for the next phase of development. It allows the next phase to begin before the previous step is operational. For example the space based transport stage (Trans Stg.) commonly referred to as a space tug, can be started before the CSS freighter becomes operational. The Lunar Transfer vehicle can be used as cis-lunar transfers or asteroid/comets interceptions. The modular system design permits in-space subsystems upgrades. The space transportation system for the 21st century must be developed as an evolutionary process using "space based" vehicles. The initial space based vehicles would be small unmanned vehicles supporting robotic missions. The development schedule for large crewed spaced based vehicles will accelerate or decrease as the funding and needs for space exploration requirements dictate. Space tugs must be a top priority for the space transportation system. They are a key factor for reducing mission cost and increasing mission success. Tugs can be supplied by the CSS freighter and expendable launch vehicles. Tugs can support near earth, lunar, and deep space missions. The first step to a “Star Trek Enterprise” space cruiser is the unmanned space based tug. NASA’s future is in the development of these space based vehicles to be operated by the commercial sector. The proposed Russian vehicle called the Parom is a space based inter-orbit “tug”. The Parom will rendezvous with the launch vehicle, capture the new payload and/or transfer the old payload. Then transfer the new payload to the next phase of its mission. Deep space missions could be designed for a thermal aero-brake entry system. The aero-brake conducts several skip entry maneuvers to slow to low earth orbit velocity where the CSS freighter rendezvous with it for cargo retrieval and deploy. The NASA proposed VASIMR plasma rocket and NERVA nuclear engine are concepts for deep space propulsions systems. However, these future concepts will remain paper studies until the launch cost to orbit is significantly reduced. There must be a defined affordable launch mass capability before any deep space transportation vehicle can be developed. The CSS freighter is the first step to deep space operations. 1.) Space based vehicles are the logical and mandatory requirement in the establishment of a baseline concept for a cost efficient advanced space transportation systems. Lifetime of these vehicles would be expected to be 10 to 20 years and therefore would significantly reduce the cost of deep space transportation. 2.) Development of space based vehicles provides an exciting and meaningful endeavor for NASA and its contractors. 3.) Space based vehicles will reduce the orbital debris problem. 4.) The inert weight of the expendable upper stage would not have to be orbited. 5.) Provides a test platform for testing and recovering hazardous advance concept space engines (nuclear, toxic, etc.). 6.) Of particular interest is the capability to provide affordable access to unmanned space commercial laboratories and space manufacturing facilities. Expendable launch vehicles suffer from an unsolvable problem…every launch is the first test flight which can have unknown flight terminating manufacturing defects. Only reusable launch vehicles like the CSS freighter can solve this problem! Expendable launchers have a historical flight rate of around 5 percent. Reusable launch vehicle has the potential to reduce the flight to less than 2 percent. The CSS freighter has the capability to save the payload and the vehicle in the event of a flight terminating failure and return to the land…in addition to significantly lower launch cost. To continue development of expendable launch only invites more failed launch programs. Don A. Nelson is an aerospace consultant and writer. Mr. Nelson retired from NASA in January 1999 after 36 years with the agency. He participated in the Gemini, Apollo, Skylab, and Space Shuttle Projects as a mission planner and operations technologist. Mr. Nelson was a supporting team member for the first rendezvous in space, first manned mission to the moon, first manned lunar landing, and the first flight of the Space Shuttle. During his last 11 years at the NASA Johnson space Center, he served as a mission operations evaluator for proposed advanced space transportation projects. Mr. Nelson is a graduate of Southern Methodist University School of Engineering. He is a certified private pilot and holds a Phase VI Pilot Proficiency Wings award from the Federal Aviation Administration.